An electrifying first collection from one of the most exciting short story writers of our time "What distinguishes Ottessa Moshfegh's writing is that unnamable quality that makes a new writer's voice, against all odds and the deadening surround of lyrical postures, sound unique." -Jeffrey Eugenides, in judges' citation for The Paris Review's Plimpton Prize for Fiction. Ottessa Moshfegh's debut novel Eileen was one of the literary events of 2015. Garlanded with critical acclaim, it was named a book of the year by The Washington Post and the San Francisco Chronicle, selected as a BEA Buzz pick, and nominated for a National Book Critics Circle Award. But as many critics noted, Moshfegh is particularly held in awe for her short stories. Homesick for Another World is the rare case where an author's short story collection is if anything more anticipated than her novel. And for good reason. There's something eerily unsettling about Ottessa Moshfegh's stories, something almost dangerous, while also being delightful, and even laugh-out-loud funny. Her characters are all unsteady on their feet in one way or another; they all yearn for connection and betterment, though each in very different ways, but they are often tripped up by their own baser impulses and existential insecurities. Homesick for Another World is a master class in the varieties of self-deception across the gamut of individuals representing the human condition. But part of the unique quality of her voice, the Moshfeghian experience, is the way the grotesque and the outrageous are infused with tenderness and compassion. 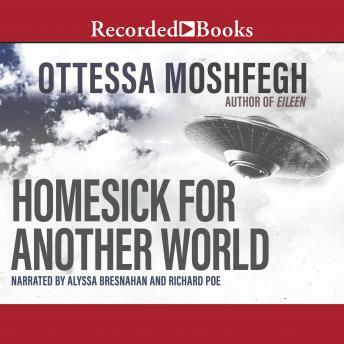 Moshfegh is our Flannery O'Connor, and Homesick for Another World is her Everything That Rises Must Converge or A Good Man Is Hard to Find. The flesh is weak; the timber is crooked; people are cruel to each other, and stupid, and hurtful. But beauty comes from strange sources. And the dark energy surging through these stories is powerfully invigorating. We're in the hands of an author with a big mind, a big heart, blazing chops, and a political acuity that is needle-sharp. The needle hits the vein before we even feel the prick.